Can any LCD this size be worth a grand? First impressions of the JVC LT-32DS75 aren't great. For even though it costs a fair whack, its finish is less than impressive - a vision in flimsy plastic. Connections fail to set our pulse racing too: there's just one HDMI rather than two, and only two Scarts. Still, there is a component video jack demanded by the HD Ready specification, a PC input, and a CI slot for adding subscription channels to the digital tuner. The digital tuner is backed up by the Freeview seven-day EPG, which can additionally be filtered by programme genre or be used to directly set timer events. 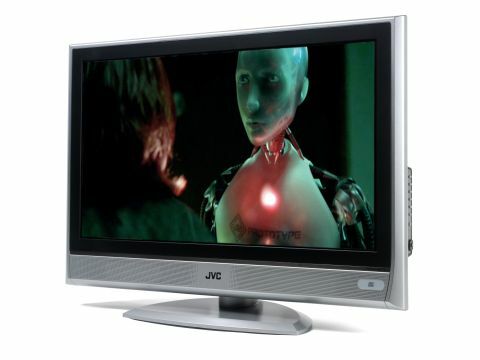 Every TV these days seems to carry fancily named proprietary picture processing, and this JVC is no different. Called DynaPix HD, this system's talents include adding more fine detail, reducing blocking noise from the digital tuner's MPEG decoding, making motion appear cleaner and smoother, and 3D Y/C separation to make the processing more focused thus able to eliminate more noise. Another JVC exclusive is Super Digipure, which analyses the image and automatically soups up or tones down the contrast according to what it calculates the image needs. Applied to a Sky HD recording of I, Robot, all this high-tech picture trickery delivers occasionally outstanding results if you're careful with the Super Digipure option. Set this too high and you'll be experience some serious video noise. Colours are a key 32DS75 strength. During the a street-chase scene, the backdrops of the city look vibrant, and command attention. Despite their vibrancy, though, colours also look engagingly natural, except for the occasional low-lit skin tone. The brightness of this scene also shows the JVC's white balance to be nicely judged for video viewing, and black levels are impressively deep. Our only complaints about the LT-32DS75 are that dark picture areas look a touch hollow and, despite the efforts of DynaPix HD, it doesn't do quite as much justice to HD detailing as we'd ideally like. I, Robot's long-distance shots of Chicago, for instance, don't look as crisp or defined as they can. It doesn't help, either, that the film's more kinetic scenes show gentle motion blur. Still, these limitations don't generally stop the picture from at least looking endearingly natural. The potent sound mixes of action sequences are delivered with plenty of volume, soundstage width and aggression, though trebles sporadically sound harsh, and voices can get slightly overwhelmed. Overall, while the LT-32DS75 has just enough flaws to make us blanche at its £1,000 asking price, it's still well worth considering if you can find it discounted online.